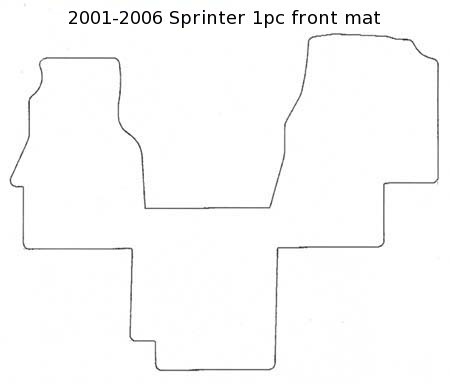 Custom made Lloyd Ultimat carpet floor mats for 2001 - 2006 Sprinter. May also fit some RV Sprinters with 5 cylinder engine. Mats fit over the original plastic floor and will not fit over carpet. Mats are made to order and ship within 3 business days. Free shipping only to 48 US contiguous states. Please allow an additional 1-5 business days for delivery to most US locations. These mats are really great! The carpet is thicker than expected- very plush. We ordered the black, and they look sharp. Nice feel over the standard rubber floor. Highly recommended. Very high quality! Prompt shipping and great service. Makes the Sprinter much nicer to drive. The fit was perfect, they are nice and thick, a wonderful upgrade to the rubber/plastic floor. Lloyd carpet mat respect all expected qualities and I’m very satisfied with this product. Every Sprinter’s owner should have one to improve beauty and comfort of the vehicle. The new floor mat was a great value, much thicker and better made than my gray,worn, original. It was a perfect fit and the black color gives the right contrast to my gray interior.